The Personal Stories Project and One Million Kids for Equality are pleased to announce the date and location for our 2nd Annual Spring Mixer and Garden Party! Food and alcoholic/non-alcoholic beverages and entertainment will be provided. 10% of the proceeds from this event will be donated to an LGBTQ youth-serving organization. 45% will go towards the Personal Stories Project’s digital storytelling program, and the remaining 45% will go towards One Million Kids for Equality’s public storytelling events. 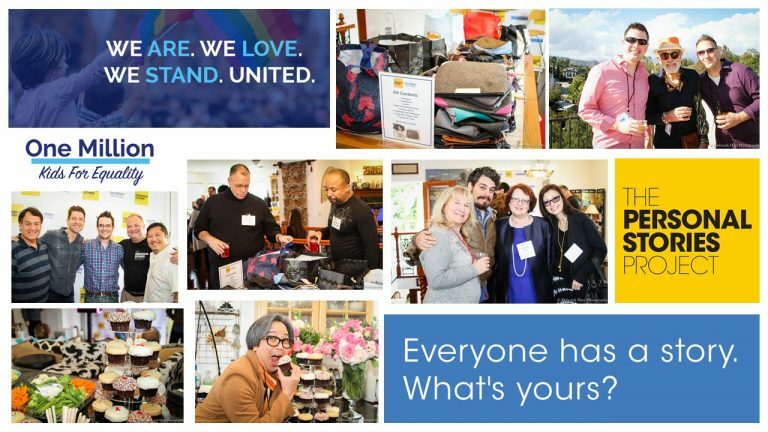 Guests will have the opportunity to participate in an optional hands-on team building activity, helping to assemble personal hygiene kits to be donated to an LGBTQ youth-specific transitional housing facility. By popular demand we will again be holding both a raffle and silent auction. In-kind donations of food and beverage, bottles of wine, raffle and silent auction prizes are welcome (and very much appreciated). Do you work for a restaurant or a hotel or have connections? A gift certificate for a stay, brunch or dinner would be great! Gift baskets, autographed copies of books, etc. are other great raffle items. We will again be distributing gift bags at the end of the event. Last year we included pens, notebooks, keychains, gift cards and other fun and useful items. This year we’re expecting 100 people so we’d love 100 of anything you might like to include in our bag to help spread the word about your product or service. Interested in sponsoring or need additional information?